Based on observation data from the collocated ionospheric scintillation monitor and ionosonde at low latitude station, Dr. WANG Zheng and Prof. SHI Jiankui from the State Key Laboratory of Space Weather, the National Space Science Center, statistically analyzed the correlation between ionospheric spread F and scintillation in the Southern Hemisphere during the high solar activity year. In low latitude region, the ionospheric scintillations are caused by plasma bubbles. Some studies suggested that the statistical patterns of ionospheric spread F and scintillation had no similarity at all. Yet, based on observations at Hainan low latitude station, Prof. Shi classified the spread F into four types, and revealed that not only did the Strong range Spread F (SSF) have a good correlation with the scintillation, the SSF was veritably resulted from the ionospheric plasma bubble. Italian space physicist Alfonsi et al. followed Prof. Shi’s method and statistically studied the correlation between the scintillation and SSF based on observations at Tucumán station in South America. Their results supported Shi’s view on the SSF and the ionospheric plasma bubble. However, the ionospheric parameters and irregularities have strongly variable regional characteristics. There is no report on the correlation between the scintillation and SSF in the Oceania region in the Southern Hemisphere. To further probe into the correlation between the ionospheric spread F and scintillation, the research group also conducted a statistical analysis based on observation data from the low latitude station Vanimo in 2003. 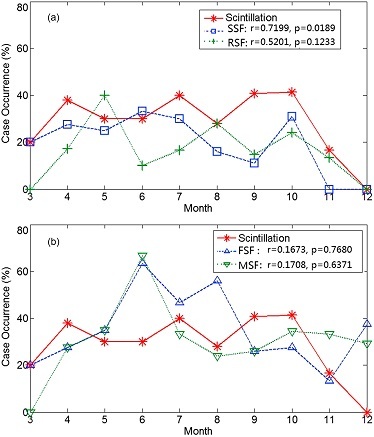 Results showed that the observed SF had four types, which are frequency spread F (FSF), mixed spread F (MSF), range spread F (RSF), and strong range spread F (SSF), whereof the branch spread F (BSF) never occurred in Vanimo station in 2003. It has been proved that SSF and scintillations usually occurred simultaneously and had almost the same periods and similar trends. Among them, SSF is the only one to have a high correlation (coefficient 0.7199) with the scintillation, while the other three were uncorrelated. (Figure 1). However, the ionospheric parameters and irregularities have strongly variable regional characteristics. There is no report on the correlation between the scintillation and SSF in the Oceania region in the Southern Hemisphere. Except for ground based observation, the research group also analyzed satellite observations. Related results further confirmed that the SSF were caused by the plasma bubble in the low latitude region. As for other authors’ claim that the spread F was independent from scintillation, the research group explained that more than likely that they did not identify the spread F in types. This study is significant to understand the process of ionospheric plasma bubbles and the physical mechanisms of the different type spread F in equatorial and low latitude region. It is also important to the study on the scintillation-related phenomena and improvement for the scintillation forecast models. The results entitled Correlation between Ionospheric Strong Range Spread F and Scintillations Observed in Vanimo Station were published on the Journal of Geophysical Research (JGR): Space Physics hosted by the American Geophysical Union (AGU).